4 | Register for recreation programs online at rentonwa.gov/cybersignup We now have newer computers with the ability to boot either Windows 7 or Windows 10. Some classes use Windows 10 for instruction, with one class dedicated to only Windows 10. Android Smart Phone to Computer Have you ever wanted to save those valu- able pictures that you have taken with your smart phone? Your charging cable can also be used to connect to your com- puter and transfer files to it. You can also use free accounts like Gmail, Outlook. com and others to automatically trans- fer your files for free using storage that it is completely secure and easily available. With this class, you will learn how to iden- tify those files that store your pictures on your phone and put them on your com- puter freeing up space on your phone if you want. Prerequisite: basic computer skills, Android smart phone and charg- ing cable. This is a one-day class. 60075 Wed Aug 9 9:30–11:30am 60076 Tue Sept 5 9:30–11:30am CMP $15R / $18NR Cloud Storage You might have heard about cloud stor- age or using the cloud. You may even be using it and not realize it. This course will give you an introduction to what the cloud is, how to use it, and if you need it or prefer not to use it. If you have a Microsoft account or a Google account you are using the cloud and have access to cloud storage although there are many others that offer cloud ser- vices as well. Google Photos offers unlimited storage for your pic tures, automati- cally backed up from your A n d r o i d s m a r t p h o n e . Microsof t uses OneDrive and Google uses Google Drive for the use of free storage, including some applications for free, avail- able with either account. Af ter this class, you will know the pros and cons of using their free cloud services. Storing documents, pictures or other files can give you access any where you have access to a com- puter and the internet. Prerequisite: basic computer skills and one of the Microsoft or Google accounts. This is a one-day class. 60068 Wed July 19 9:30–11:30am 60069 Tue Aug 22 9:30–11:30am 60070 Tue Sept 26 12:30–2:30pm CMP $15R / $18NR How to Use a USB Drive Learn how to save to an external storage device like a USB drive. It is commonly used to save documents, pictures, and other files that are important to you. More and more people are using this storage device instead of DVDs. Also, what happens if your computer will not boot up (start)? Learn how to transfer or save files to a USB drive or set it up to be used in an emergency. Prerequisite: basic computer skills. Recommended: an 8GB thumb (USB) drive. This is a one- day class. 60073 Wed Aug 2 9:30–11:30am 60074 Mon Sept 25 12:30–2:30pm CMP $15R / $18NR Introduction to Android Smart Phones Those of you who've never had a smart- phone before may find navigating the cell phone a challenge at first. While there are many different versions of Android with manufactures putting their own software along- side Android. The look and feel of the cell phone can be different. There are some basic beginner's tips that everyone can use to master Android. You will learn how to turn the phone off and on, turn the screen off and on, navigation basics, setting up home screens, m a k i n g a n d r e c e i v i n g phone calls, adding to your contact list, text messaging, and navigating the vari- ous applications that come with the phone along with some suggestions on what applications to download from Google's Play Store. Please bring your smar t phone if you have one (not iPhone or Windows phone). A Google account is recommended such as Gmail. This is a three-day class. 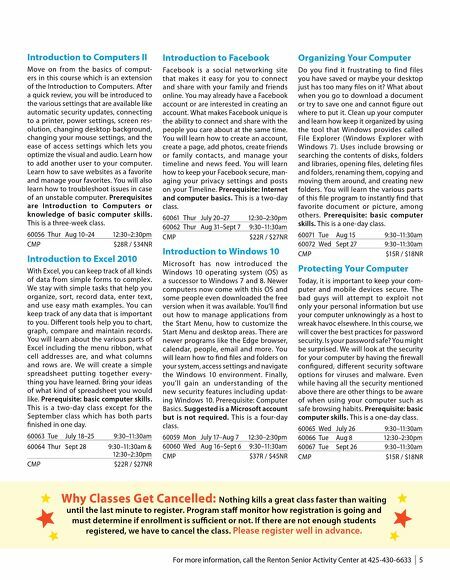 60057 Thur July 20–Aug 3 9:30–11:30am 60058 Mon Aug 14–28 12:30–2:30pm CMP $28R / $34NR Introduction to Computers Are you new to computers or need a refresher course on how to use them? In this course, you will learn the very basics of computers by learning how to use a mouse, basic keyboard skills, and some basic computer terminology. You will learn how to navigate around what you see on the monitor (desktop) by using the Microsoft Windows 7.0 Operating System (OS). You will learn how to use the soft- ware that is on the computer including how to access the help system and how to navigate the file system where your items or things you want to keep are stored. You will learn how to access and browse the internet. Included in this course are basic maintenance and safety precautions for the computer. This is a four-day class. 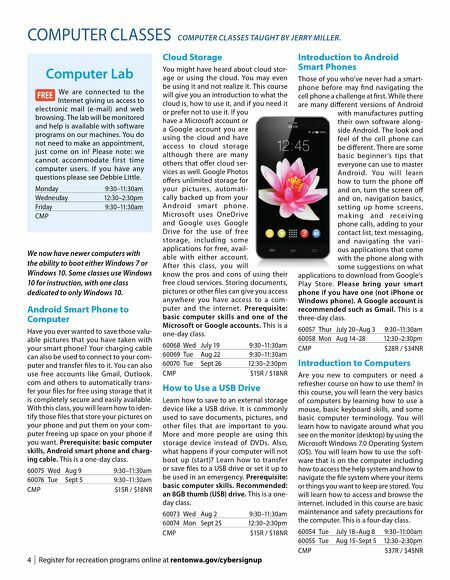 60054 Tue July 18–Aug 8 9:30–11:00am 60055 Tue Aug 15–Sept 5 12:30–2:30pm CMP $37R / $45NR Computer Lab We are connected to the Internet giving us access to electronic mail (e-mail) and web browsing. The lab will be monitored and help is available with software programs on our machines. You do not need to make an appointment, just come on in! Please note: we cannot accommodate f irst time computer users. If you have any questions please see Debbie Little. Monday 9:30–11:30am Wednesday 12:30–2:30pm Friday 9:30–11:30am CMP COMPUTER CLASSES COMPUTER CLASSES TAUGHT BY JERRY MILLER.